Google Fi (formerly Project Fi) piggybacks off existing T-Mobile, U.S. Cellular, and Sprint cell towers, so in a way, it's like three carrier networks combined into one. To make the coverage even better, all Google Fi phones get automatic access to a nationwide network of secure Wi-Fi hotspots (hence, the "Fi" in their name). But with so many different connections in play here, Google Fi has only worked with certain phones in the past. Until now, your options were limited to Google's own Pixel phones and an occasional device from Motorola or LG. However, now that Google has announced support for iPhones, Samsung Galaxy devices, OnePlus phones, and several other models, Fi is a thrifty option for almost anyone. Google Fi combines the networks of T-Mobile, U.S. Cellular, and Sprint to offer rock-solid coverage that should cover more area than any of those individual networks. 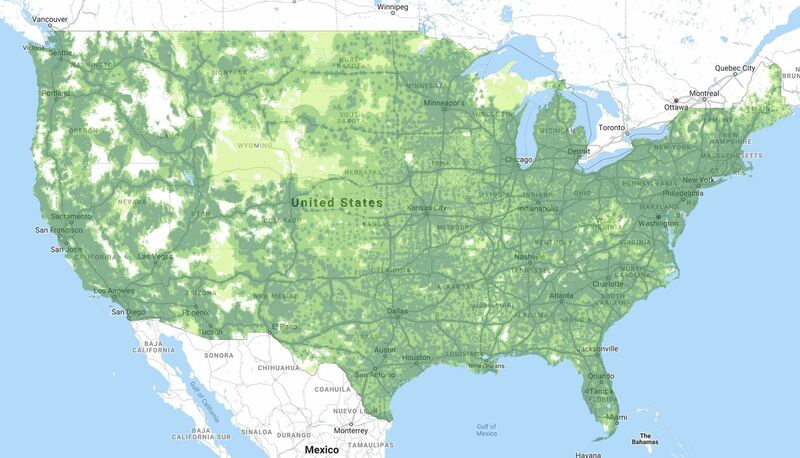 However, Google's carrier service is still too new to have been thoroughly reviewed by independent testers like RootMetrics, so you should make sure to check your ZIP code in the Google Fi coverage map before you consider a switch. But coverage isn't the biggest selling point for Google Fi, as data plans start at an amazingly cheap $20/month. 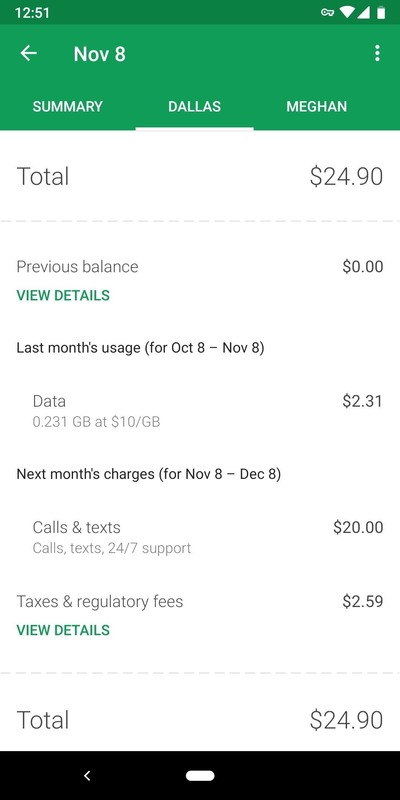 In fact, Google Fi's base pricing is about as straightforward as it gets: Pay $20/month for a line and get unlimited calls and texts, then add $10/month for each gigabyte of data used. The data rates are down to the penny, so 1 megabyte of usage costs you one cent. Things are slightly different when you add more than one person to your plan. With Google Fi group plans, the first line still costs $20/month, but all lines after that (up to five) will only cost $15/month. Beyond that, the same $10/gigabyte pricing applies to data usage on each individual line. 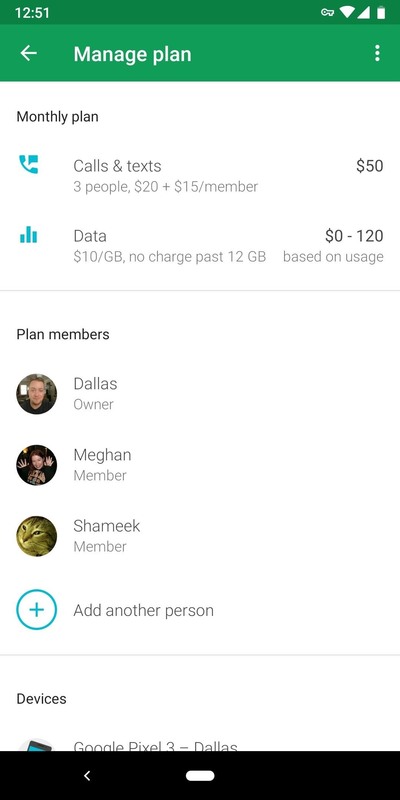 The most complicated aspect of Google Fi's pricing scheme is Bill Protection, but this only becomes a factor when you use a lot of data, and even then, it only benefits you. In short, you'll never pay more than a certain amount for data, though this number varies depending on how many people are on your plan. If you're a single user, you'll never pay more than $60 in a month for data regardless of how much you use. That number goes up to $100 for two people, $120 for three, $140 for four, $160 for five, and $180 for six. Until you hit those thresholds, you're still billed at the usual $10/GB rate — but after you hit those max amounts, all data usage is free. Think of it like an unlimited plan that lets you pay less if you don't use a ton of data. It's worth noting that Bill Protection isn't immune from throttling. Once you hit 15 GB for the month on a single line, your data speeds are throttled, so internet will be slower after this point. If you're on a group plan, each line has this 15 GB throttling threshold, regardless of your collective data usage. Google Fi's rate schedule means that it's extremely cost effective if you don't use a ton of mobile data, but heavy users can get priced out rather quickly. $50/month for unlimited talk, text, and three gigs of data is great — but if you up the data usage to six gigabytes per month, you're suddenly looking at a nearly three-digit phone bill. At what point does Google Fi become the more cost-effective option, and how much data can you use? According to research firm Cowen and Company, 4G LTE service plans like Google Fi's cost $103/month on average for a single user. For the sake of simplicity, let's (generously) assume $13 of that is going towards taxes and fees, which brings us to a $90/month pre-tax average. At that rate, you could switch to Google Fi and save money if you used any amount of data. Again, Bill Protection kicks in at $60 for data, so you'll never pay more than that for mobile internet usage. Add the $20 line charge for a single user, and you're at $80 before taxes and fees. But that's if you hit your Bill Protection threshold. If you use less than 6 GB in a month, you'll save even more. 5 gigs would result in a bill of $70, 4 gigs would cost you $60, and so on. Compared to that $90 average, you'll save at least $10 a month. The only situation where you wouldn't save money on Fi when compared to the national average is if you typically use more than 15 gigabytes of data each month. If you use more than that, Fi would throttle your connection to 2G speeds as mentioned above, which would make data all but unusable. You could get around that by opting to pay $10/GB for each gig over 15, but that would quickly put your bill over the national average. Just 16 GB of usage would hit the aforementioned $90/month threshold. But there's another important area where Fi can save you money: international travel. Google Fi offers data coverage in over 170 countries at no extra charge, meaning you'll still get that same $10/gigabyte pricing overseas while accessing the fastest available data networks in that area. A few other carriers offer similar deals, but these roaming plans generally throttle your data down to 3G speeds. If you're currently locked into a 2-year cell service plan, most carriers would require a $200 Early Termination Fee (ETF) if you decided to switch to Google Fi. But even then, you could hit your Bill Protection threshold every month on Google Fi, eat the $200 ETF, and still come out ahead over a 2-year period (and that's not including data overages and other fees). Bottom line, Google Fi is more cost-effective than the average cellular plan regardless of how much data you use, but if you use fewer than 6 gigabytes each month, you'll save a lot more. And even if you're currently locked into a cell service plan, you could sever ties, take your compatible phone to Fi, and still save money. For my clarification, you would have to buy the Pixel from Verizon (?) and then switch it to Fi? Does it require rooting? For example, typically, a phone bought for Sprint has to stay with Sprint unless you root it. ?? You can purchase the device directly from Project Fi. Just go to https://Fi.google.com and click the green Join Fi button on the top right of the webpage. While you are signing up, you will have the option to select the device you need. No need to go through Verizon at all. Switched from straightalk, there are ups and down. The customer service is 100% better, but the plan is pricey, I got 5gb of high speed data for 45 a month, or if I really needed more I could go 10 gigs for 55. If I am careful I can save money, but that usually doesn't happen. I'm not so sure about any "serious savings." I have a Nexus 5 and an AT&T GoPhone plan. $45 per month for 3 gigs of data. I'm on the auto "refill" plan which saves $5 per month, add back in the taxes/fees and I'm at $44.43 per month all in . AT&T also rolls over the unused data from the previous month (it doesn't keep rolling over, just for one month) but it's better than nothing. I rarely use all three gigs so I guess Project Fi would save me something but it certainly isn't going to be a lot. I've used AT&T for years and think their cell service is pretty good. When I bought the phone from Google I walked into the local AT&T store and was done in about 10 minutes. No activation fees either. To use the 3GB example in Texas .... I pay 20 for the line 30 for 3GB 5for caution style protection and 4.91 for taxes .... The reality is nearly ever month my follow up bill is usually in the 34 to 39 range as I have leftover data .... Now if you have a tablet you want to add... You can add a data sim for free. This right here is the key. In my area everything but maybe Verizon and us cellular are spotty or slow(as in no LTE). So while I may be able to get. A similar price(perhaps less but I doubt it) through others it's normally not worth it. Since US Cellular joined haven't been without LTE. This is why Project Fi's hardware offerings have thus far been limited to the Nexus lineup, but with the Pixel's launch, the carrier now has a premium handset in the fold. Um no. There are plenty of handsets that have the needed hardware. The fact that Google chooses not to share their software special sauce for the network switching is a policy decision and nothing more.